If Jason Yoder were on a desert island and could only take one item with him, he’d bring a Frisbee. Luckily, the 2008 Goshen College graduate and doctoral student at Indiana University Bloomington somehow finds ample time to play with flying discs as a member of the Indianapolis AlleyCats, a professional Ultimate team that formed in 2012. Known as “Fast Jason” among friends and fans, Yoder first discovered his passion for Ultimate at Goshen College during pickup games on the fields by the residence halls. At the end of his freshman year he joined an organized league in the area and never looked back. After graduating from Goshen and moving to Bloomington, Ind., to pursue a dual doctorate in computer and cognitive science at Indiana University Bloomington, he continued to play Ultimate on club teams and began coaching the IU men’s teams. When the American Ultimate Disc League and the AlleyCats were formed in 2012, Yoder was thrilled. “The chance to play on a professional team for the sport that I love more than any other, and to have it so close to where I live—it seemed like a dream come true,” Yoder said. Professional Ultimate differs from club leagues in several significant ways, Yoder said. Gameplay is faster and the field is 33 percent wider, making it more challenging to cover a wider space of potential throws. Referees officiate games so that players don’t have to spend time making their own calls. And unlike club Ultimate, where you might see a handful of spectators, it’s not unusual to see hundreds or even thousands of people in the crowd. “The adrenaline you get from hearing a crowd is surreal,” Yoder said. 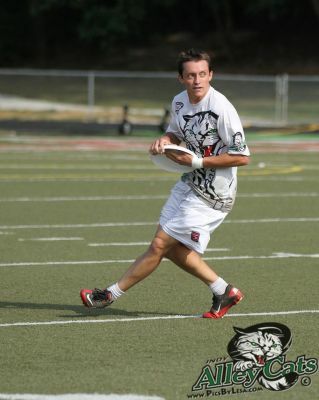 As an AlleyCat, Yoder generally plays defensive handler, which means he is responsible for guarding opponents as well as handling the disc, similar to a football quarterback. When playing offense, he tends to pick up the disc and throw more frequently than the cutters, who are like wide receivers in football. Once he catches or picks up the disc he has seven seconds to throw it to a teammate. A seasoned player, Yoder enjoys passing on his knowledge of Ultimate to younger players both at the collegiate and high school levels. In addition to coaching the IU Bloomington men’s teams and helping with the women’s team, Yoder has also volunteered to help Bloomington High School players in his spare time. It’s rewarding to develop talent at the high school level and watch players enter college already able to play competitive Ultimate as first-year students, Yoder said. When he’s not tossing discs as an AlleyCat or coaching young players, Yoder continues his doctoral research. Yoder is developing and coding a model of neuromodulation into an artificial life simulator called PolyWorld. Using a computer, he simulates small robot-like creatures to eat, mate and move around, and observes the interesting behaviors that evolve in the population over time. According to Yoder, cognitive science and Ultimate have more in common than people may realize. Yoder plans to complete his Ph.D. thesis in 2015 and hopes to find work that combines his love of programming with his love of teaching. But that will not stop him from making time for his greatest passion.